Our new F-15C ARF full composite kit is aimed at the market of scale enthousiasts and scale competitors, so we expect that the majority of our customers want a full fledged scale functioning landing gear with the doors working like on the full size. However, there may be reasons for wanting a more simple set up and that's why we offer a range of landing gear solutions: from sophisticated rotating scale gear with all sequencing gear doors and scale detailing (see photograph below) to the simple non rotating gear without doors. An upgrade to the scale landing gear or a more sophisticated gear doors option is always possible later. The retracts are offered in two types: either the scale rotating gear (PA504A) or the "simplified scale" non rotating gear (PA504B). 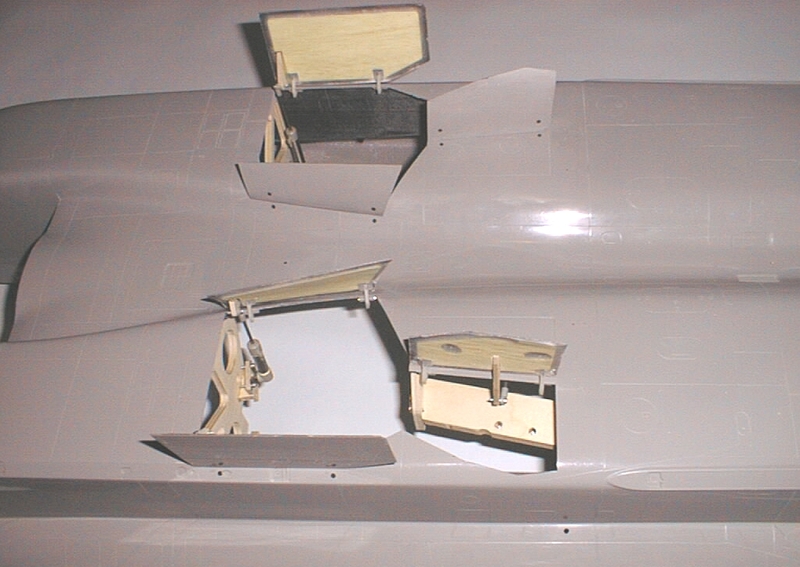 Both have the same mounting dimensions and are a drop in fit: the CNC routed retract bearers with the blind nuts are already installed in the airframe. 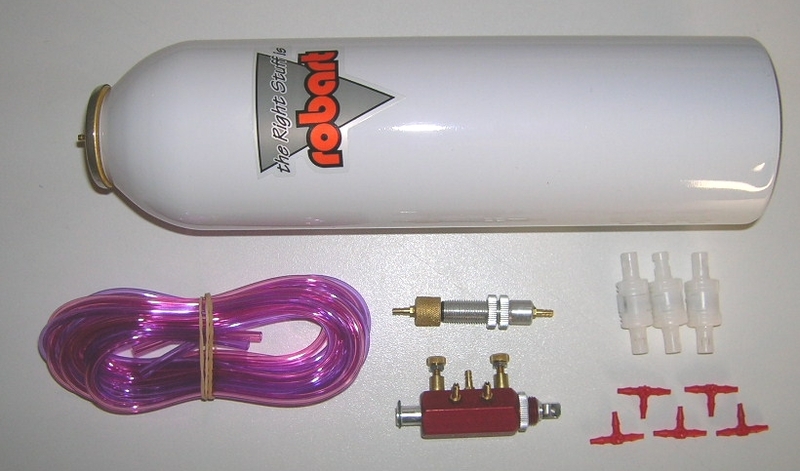 The basic units have non standard retract angles and are custom manufactured for us by Robart. Then we modify the mounting lugs to allow them to fit in the scale location of the F-15C. Be advised that standard retracts will NOT fit in the F-15C! PA505A Type A scale landing gear air support and 8 scale sequencing doors: two doors on the nose gear and three on each main gear. This configuration is totally scale including the configuration and sequence during landing gear travel. The scale rotating gear (PA504A) will only work with the PA505A type A kit (scale landing gear air support and 8 scale sequencing doors). The rotating main struts have sufficient clearance when retracted to be detailed with the scale details such as scissors etc. (scale option PA510-MAIN, see further). The main wheels rotate through 90 degrees upon retraction, per the full size F-15. This requires all doors to be operational. The "simplified scale" non rotating gear (PA504B) will work with any type of the offered landing gear air support and gear door kits. be advised, the main struts DO NOT have sufficient clearance when retracted to be detailed with all scale details such as scissors etc. (scale option PA10-MAIN, see further). If you want to add these details, please choose the scale rotating gear set PA504A. On the ground, there is no visible distinction between type A and type B. However, because of clearance issues when retracted, the number of scale details you can add to the "simplified scale" non rotating main struts is limited, so this may affect your choice. Type B is basically the same as type A, only the inner forward main doors are fixed as the non rotating gear will retract within the confines of the outer forward main doors. The following photographs show the difference between type A and type B door types when all doors are open. This set with aluminium main wheels and tyres, nose wheel and brakes is specially engineered for our F-15 kits although they will fit any landing gear with 3/16" (4.8 mm) wheel axles. A complete separate (from the retracts) air system is used. A leak in the brake system tends to happen more often than in the retract system. With this separate air system, the retracts are not affected and it's always better to land without brakes than without landing gear! Note: the brake hubs are manufactured by Bob Violett Models (BVM) in the USA and are patented. We then modify the anti rotation protrusions on the BVM brake hubs to fit our scale struts and to allow the fitting of the scale brake hub covers (PA508). We don’t think a proportional brake valve is needed to actuate the brakes, on the contrary. We prefer to use an "all or nothing" air micro switch valve and a predetermined pressure in the separate air tank to obtain maximum effective braking action without locking up the wheels. This way, we can adjust the servo actuating the valve to get maximum braking action with a very small amount of "down" elevator stick travel. This also avoids "lifting" of the tail due to excessive "down". 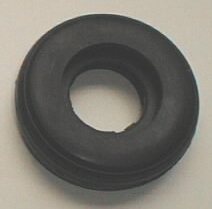 Pair of 3 ½" heavy duty tyres as included in set PA506 shown above. Made from pure, thick walled rubber so they will not flatten from model weight (if not left on its wheels for any longer than a few days). On the other hand, this allows the tyres to give plenty shock absorption unlike many aftermarket tyres which are rock solid and do not give any shock absorption whatsoever. The scale hubs reflect the full scale F-15C wheels. They are attached with two screws to a plywood ring glued inside the rim. The set consists of a pair of scale resin cast main wheel hub covers, a pair of plywood rings, 4 screws (+ a spare) and instructions. 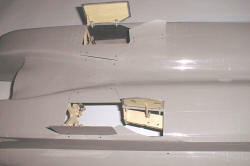 The scale brake hub covers reflect the full scale F-15C brakes. They completely cover the modified BVM brake hubs and will fit the new F-15 struts as supplied in the PA504A and PA504B retract sets. A decal sheet is also supplied to simulate the detail on the inner side of the wheel rim. The set consists of a pair of scale resin cast brake covers, a decal sheet and instructions. Basic modelling skills are required to install this detail set. The resin cast parts need to be glued to the strut with CA adhesive. The decals shown are included with any of the decal sets PA160AG, PA160BT or PA160FF. This PA510-MAIN detail set contains all the resin cast detail parts to dress up both main struts (from set PA504A only) so they look exactly as shown above (right hand strut shown only). Be advised that this set is only compatible with the rotating scale retracts PA504A due to space restrictions. The set also contains the strut scissors which can be made to move like on the full size. Customer feedback learned us that the job of cutting and hinging the gear doors is often regarded as a chore. We therefore offer the service to cut and hinge the doors at the factory as an option. The job consists of cutting the hinge lines, installing and gluing the offset door hinges, installing the hinge screws and final cutting the door contours. This procedure guarantees perfectly flush fitting gear doors. Important, this option is only available in combination with the PA504 gear door packages. 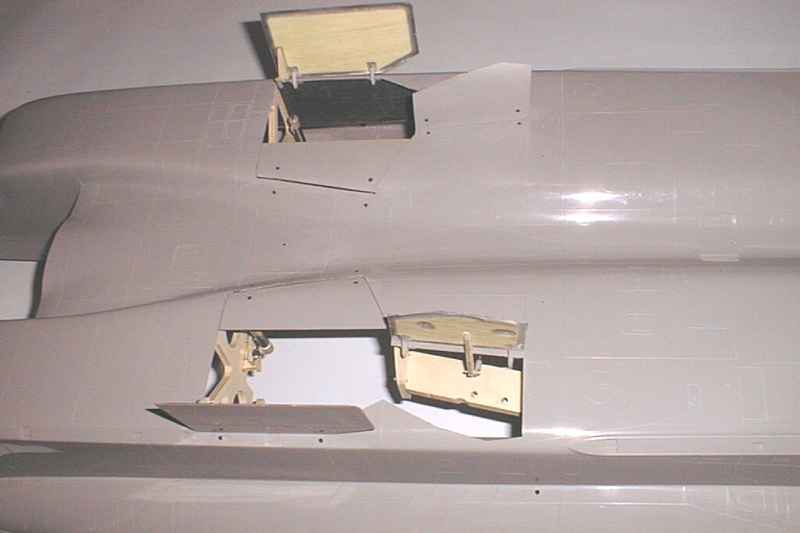 PA530-A is the door cutting and hinging service for the Type A scale landing gear air support kit with 8 scale sequencing doors: two doors on the nose gear and three on each main gear.